Land Rover LR2/Freelander 2 2009, 2010, 2011, 2012, Addition To Main Interior Kit, 32 Pcs. Land Rover Freelander 2004, 2005, 2006, Full Interior Kit, 51 Pcs. Land Rover Freelander 2 2007, 2008, 2009, 2010, 2011, 2012, Right Hand Drive, Addition To Main Interior Kit, 32 Pcs. Land Rover LR2 2008/Freelander 2 2007-2008, Addition To Main Interior Kit, 32 Pcs. Land Rover Freelander 2002-2003, Full Interior Kit, 34 Pcs. Land Rover Freelander 2004, 2005, 2006, Basic Interior Kit, 38 Pcs. Land Rover LR2 2008, 2009, 2010, 2011, 2012/Freelander 2 2007, 2008, 2009, 2010, 2011, 2012, Exterior Kit, 17 Pcs. Land Rover LR2 2008, 2009, 2010, 2011, 2012/Freelander 2 2007, 2008, 2009, 2010, 2011, 2012, Main Interior Kit, 31 Pcs. Land Rover Freelander 2 2007, 2008, 2009, 2010, 2011, 2012, Right Hand Drive, Main Interior Kit, 31 Pcs. Land Rover LR2 2008, 2009, 2010, 2011, 2012/Freelander 2 2007-2012, Stainless Steel Pillar Posts, 6 Pcs. Land Rover LR2 2008, 2009, 2010, 2011, 2012/Freelander 2 2007, 2008, 2009, 2010, 2011, 2012, Stainless Steel Pillar Posts, 4 Pcs. Land Rover Freelander 2 2007, 2008, 2009, 2010, 2011, 2012, Right Hand Drive, Over OEM Interior Trim Kit, 6 Pcs. Land Rover LR2 2008, 2009, 2010, 2011, 2012/Freelander 2 2007-2012, Exterior Kit, Optional Side Air Intake Trim, 4 Pcs. Land Rover LR2 2008, 2009, 2010, 2011, 2012/Freelander 2 2007-2012, Over OEM Interior Trim Kit, 6 Pcs. 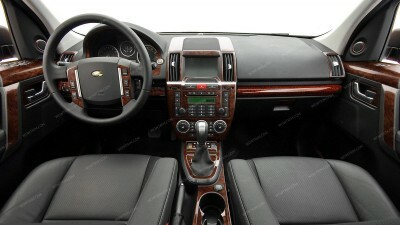 Land Rover LR2/Freelander 2 2009, 2010, 2011, 2012, Optional Overhead Console Interior Kit, 2 Pcs. Land Rover LR2 2008/Freelander 2 2007-2008, Optional Overhead Console Interior Kit, 2 Pcs.